There is a saying when you are on a good thing 'stick to it'. Well we must have been doing that well because our group decided to tour south again to Victoria to do what we can't do in New South Wales. 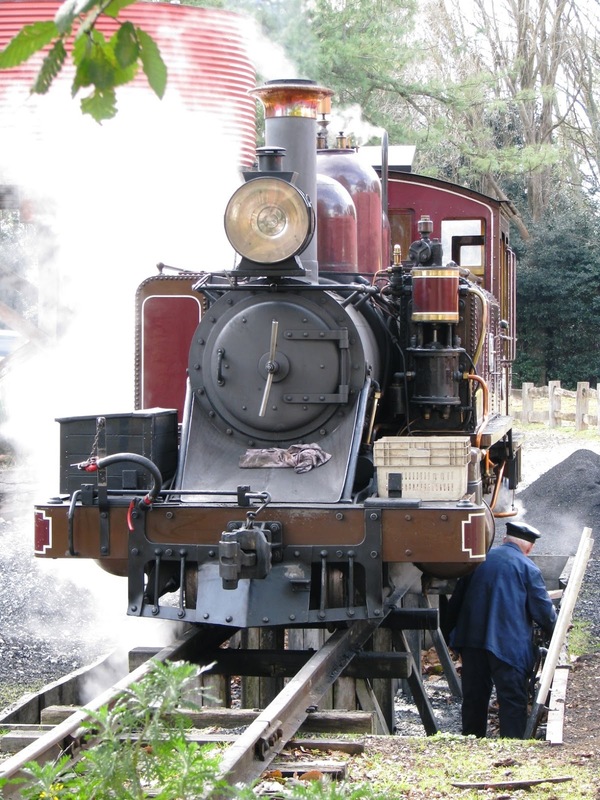 Victoria offers Steam Rail tours that actually still run double headed R class steam tours. Back in 2016 we all went to Victoria to ride Puffing Billy and do the double R steam on the Snow Train. Last year we went to Maldon/Castlemaine again with the double R's. 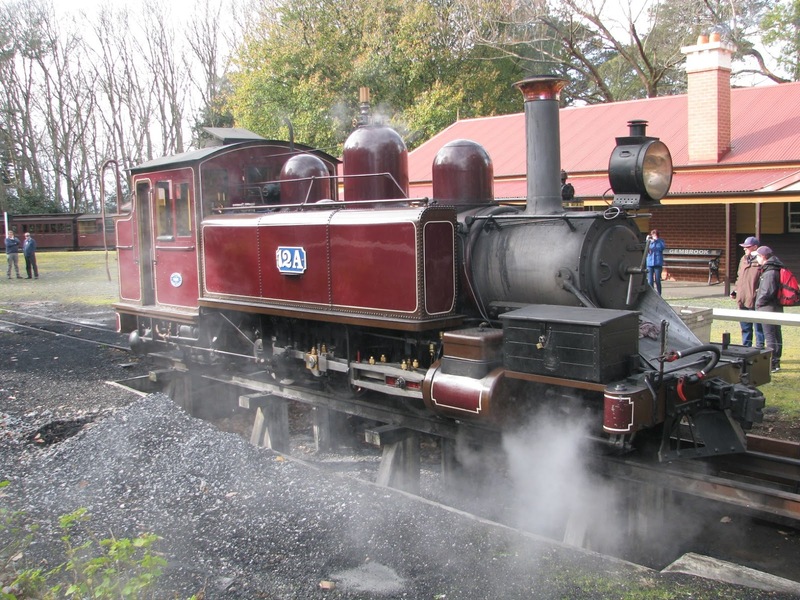 This year we had planned for variation to do the R class tour to Echuca ideal in the fact that we could have lunch on a paddle steamer on the Murray River. When the date was selected and passed around for acceptance we found out that our tour guide Phil was going to be travelling across the USA by train, not with us but with his wife. 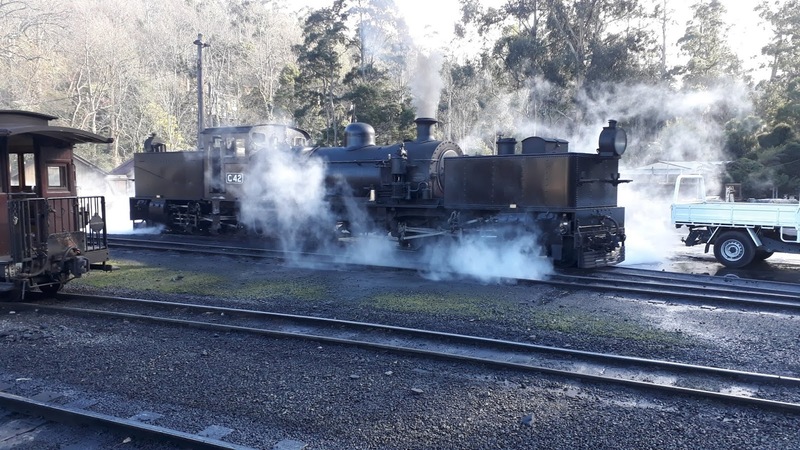 Well that threw a spanner in the works, so going back to the drawing board we found that the best we could do was a repeat of the 2016 jaunt retracing our steps to Gembrook and Walhalla on the Snow train. All accepted, and thanks to Phil our rail tickets were organised, Ross organised the plane home and we thought we might try digs closer to the station at Southern Cross. At around $100 extra a night closer it soon had up reserving at our usual hotel on Queen Street at a much lower rate. The reason it is cheaper (and explained on its website) is that there is a 'disco' in the basement that rocks the place on Friday and Sunday nights. Up again early as our train departs Central at 7.42am. Knowing that there could be hiccups I was on an earlier train with one spare to catch if the first one was a 'no show' It wasn't and I arrived at Central around 7.00am. We all met up and headed for our carriage for the next eleven hours. Back in 2016 we encountered a train strike and had to go to Melbourne by coach. The trip was uneventful and the scenery was noticeably dry as the state of NSW in a severe drought at the moment. Past trips through the Southern Highlands was through green pastures but this time a bad shade of brown. Later in the morning we passed through Goulburn with its rows of excess locomotives outside the roundhouse. Would love to see those CLP's back on the track. Anything with a GM engine would actually do. The trip is comfortable and we passed the time by chatting amongst us and a bit of catchup in sleeping was partaken. I had purchased some sangers prior to departure for lunch and washed down by some XPT coffee. The country around Yass seemed a little greener (or not as brown?). Junee was passed and some of the bigger stations had people coming and going. Some of the seats would have been still warm when some got off and the same seats were again used. Albury is our border town on the Murray River. It was starting to get darker from here and as we moved down closer to Melbourne it actually started to rain. We arrived into Melbourne on time and the usual queue of people formed down the carriage ready to detrain. The same queues form on aircraft. When we got off the train the sixth member of our group who had flown down that day greeted us. Nice to have a welcoming committee there. In earlier times (way back) he was a brother who taught us at school and was instrumental in starting up a train club at school, at thing unknown these days. As we gave the frozen fast food dinner option on the XPT we decided to head up to Lygon Street for a proper feed. Heading for Victoria I was quite prepared for all types of weather. It was actually raining there in Melbourne when we got off and it seemed I was the only one with an umbrella, so I was OK as we walked up to the hotel in Queen Street. We topped up our Myki cards at Southern Cross station so were able to jump a tram and head to Lygon Street. Ironically we visited the same restaurant as last year. It was a good meal and after we headed back to the tram and then back to the hotel for an early night ready for the Saturday trip to Puffing Billy. I think it was around 11.0pm the 'doof doof' of the disco started off, but I was tired enough to sleep through it, but not all our members did. We were up early again and as this hotel didn't supply meals and we had to allow the 15" extra to walk down to Southern Cross and have breakfast. We then caught the 8.09am train out to Belgrave an all stations trip that takes just over the hour to get there. We were all prepared for the cooler Victorian weather and this was proven when we arrived at Belgrave it was cool. Walking down from the station you get to see the long row of carriages as in the above photo. In the distance is the smoke from the locos being prepared for their trips. We went to the booking office to arrange our tickets. 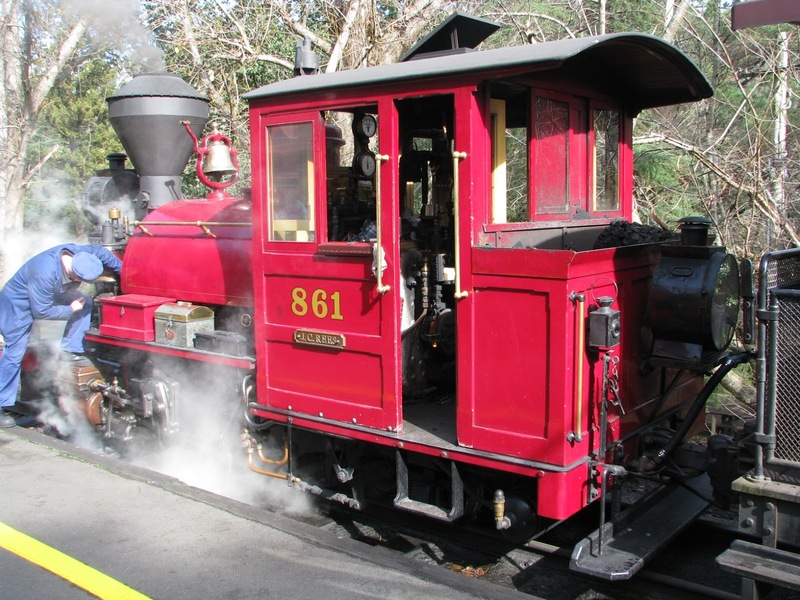 I had already joined the Puffing Billy Society and one of the benefits is unlimited free travel (too bad I don't live in Melbourne) and you can take two guests with you. A year membership for seniors is $49 but the return to Gembrook is $59, so you do the maths. It was very noticeable that (as in previous years) that a lot of the train was reserved for Chinese tourists so I am sure that Puffing Billy is glad of this endless revenue stream. 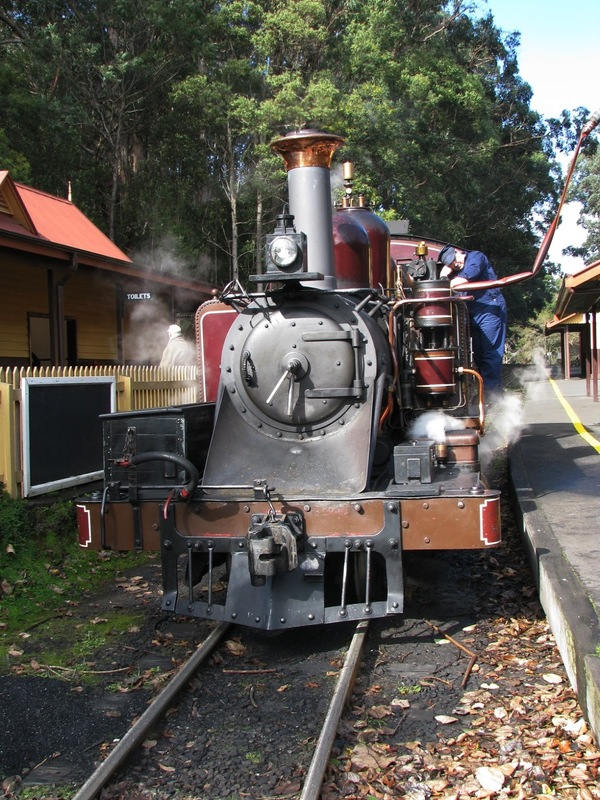 On the Saturday the 10.30am train is usually double headed with G42 and an NA to Menzies Creek. 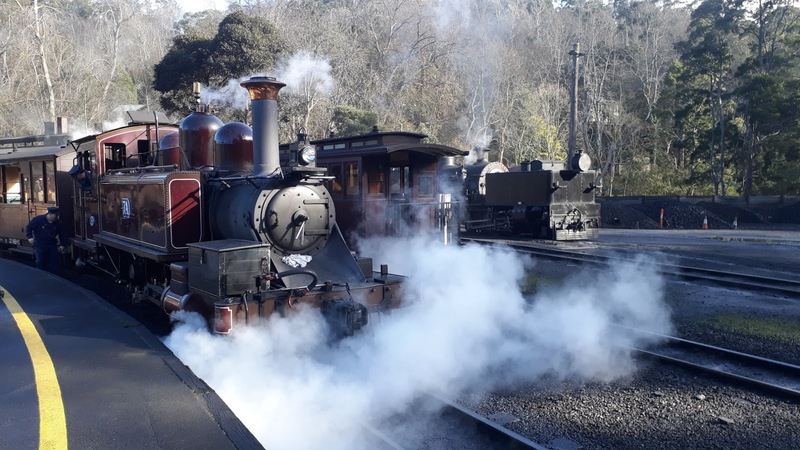 Who would have thought you could travel behind double headed narrow gauge steam in 2018? The train is divided at Menzies Creek with G42 returning back to Belgrave and the single NA taking the rest of the train onto Lakeside. Today unfortunately was my wifes birthday and here I was many hundreds of kilometres away. I gave here a ring from the train at Lakeside and did my best and hoped she would enjoy her day and sorry I wasn't there. The others did a joint 'Happy birthday' effort towards the phone. Last year at Lakeside there were many birds that gathered on the station building roof, I think for a free handout of food from the tourists but maybe it was too cold for them to come out this year. Lakeside all of a sudden became a busy place. From around the corner came loco 861. 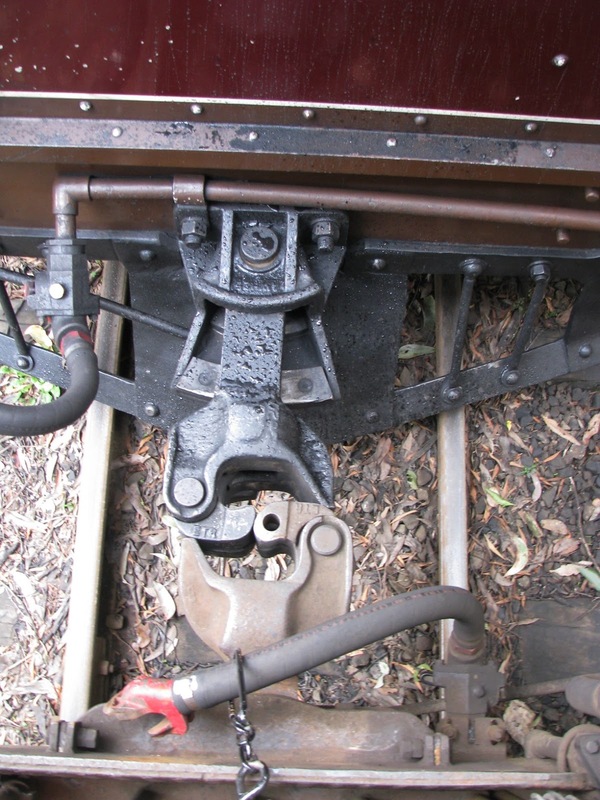 This loco was being used for a driver operation experience. The cost I believe also includes a carriage so you can take your family or mates along. And just to finish the log jam came along NVW1. 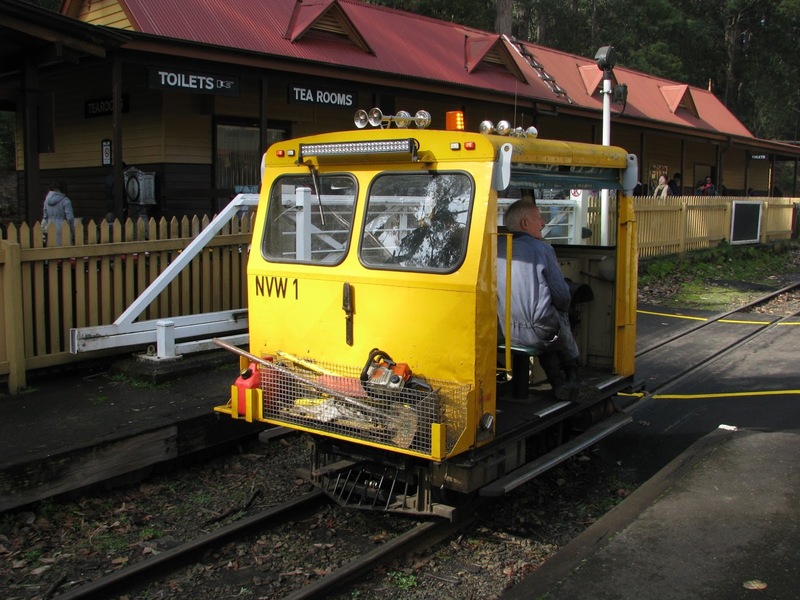 Certainly not for carrying passengers, must be a track patrol vehicle and fully non air conditioned for Victorian weather. A room for two please. 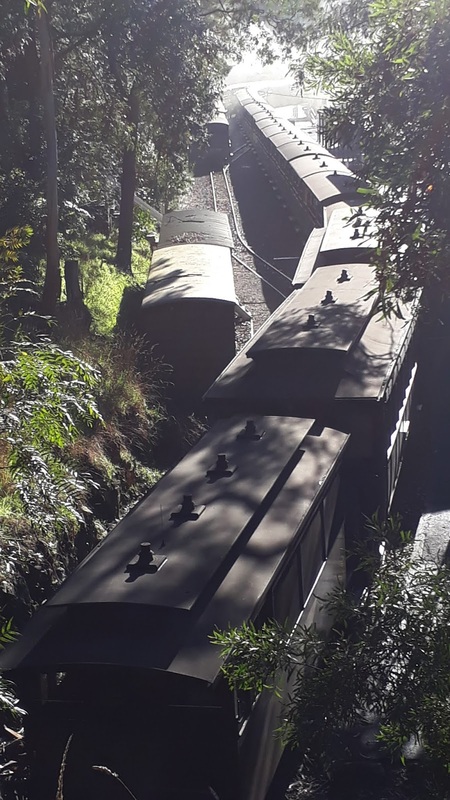 A smart move if going to Gembrook is to get the 10.30am train to Lakeside, have 40" there, maybe warm up in winter with a hot chocolate and then get the train to Gembrook when it arrives. Most of the tourists seem to end their ride here and head off into the hills on a road coach tour. There is also a large lake here that would be popular in summer. 12A arrived at Lakeside to take us onto Gembrook. We were lucky enough to find a closed in carriage at the front of the train and once the back door was closed it was quite okay inside. With beautiful scenery on both sides along the way we made the long climb up to Gembrook. Arriving there a little behind schedule we made a dash for the pub to partake of lunch. Our tour guide Phil had thoughtfully rang ahead and reserved a table for six. I was seated with an wood fire warming my back as we ate. Remembering my tall glass of cider from last year I ordered one from the bar and with an optimistic $10 note in my hand (was $9 last year) I was asked for an additional $2 for my drink. You could never get drunk at these prices. The meal was good and I left the table early so I could try and get some back copies of the 'Narrow Gauge' magazine for my collection. I overheard at the station that as the train had arrived late they put the departure back 15" to compensate. How good was that? Country life. As it was heading towards freezing many of the regular passengers had returned to the train early and grabbed seats in the only two enclosed carriages on the train. The rest were the open types and all that was available. Some of the party managed to squeeze into the front carriage and I was over talking to the guard near the engine at the ash pit. He offered me a ride back with him in the guards van, how could I reject that? We headed off from Gembrook towards Belgrave, it was still cool and cloudy. We stopped at Cockatoo where safeworking was performed, and then arrived at Lakeside. Many hopeful passengers tried to join our train back to Belgrave only to find it full. They had to wait for the train following us. I was waiting on the back platform of the train and noticed an engine moving up close to our train. The couplers were readjusted so that the jaws weren't locked and once we were ready to go this engine gave up a shove up the rising grade and shut off just outside the station. 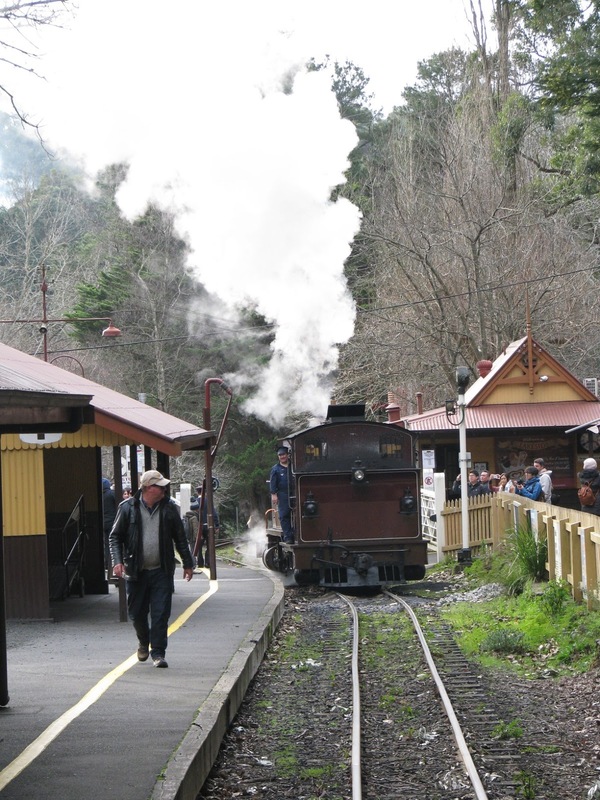 It then returned back onto the following train.We passed through Menzies Creek and onwards toward Belgrave. I managed a poor shot over the Monbulk trestle bridge. I am almost sure the train must tip to one side when travelling over this bridge.Arriving late back at Belgrave we headed up towards the next electric train back to Melbourne. It was dark when we got back and so the hunt was on for dinner. We found a place near the Yarra River at Flinders Street and after a quick meal it was to walk back to the hotel ready for an early Sunday morning start.Sunday August 5An early rise for an early departure from Southern Cross. Our train hauled by double headed R class steam was due out at 7.39am. We did the walk again ready for breakfast and then over to platform 13. It was an impressive sight when the train steamed in. A walk through the train and we found our compartment and settled in for the run down to Moe. The Snow train Sunday 5th August 2018. Alf Batchelder photo. 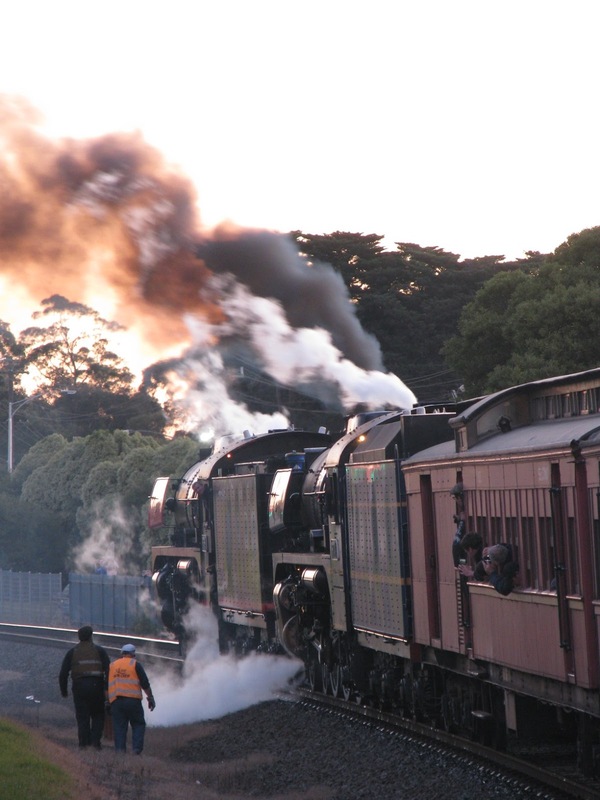 How good was it to be able to travel behind double headed steam again. 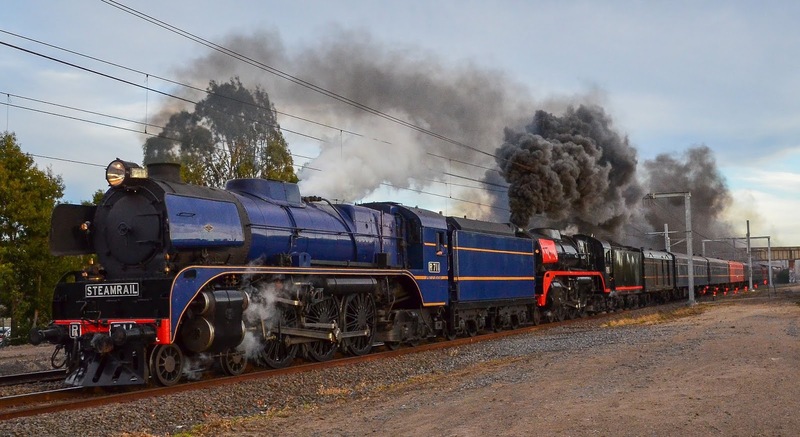 I am sure we won't get to see two 38 class locos together again in NSW.When we got to Moe station it became organised chaos. There were people heading for the snow at Mt. Baw Baw. Then there was us heading for Walhalla in 3 buses. Some passengers were doing the full train trip and going down to Taralgon and then in the mix were short haul passengers doing the Moe to Taralgon section. Well situated outside the station the local Rotary had set up a sausage sizzle and tea and coffee stalls. Only one of our party joined the queue, the rest of us thinking of our lunch waiting for us at Walhalla.Travelling through beautifull country we eventually headed down the hill and ended up near the narrow gauge station. The driver offered us a trip through the town and then dropped us off at the hotel for lunch. As we had visited this place back in 2016 the lunch had more interest. We were late for lunch but eventually got served. 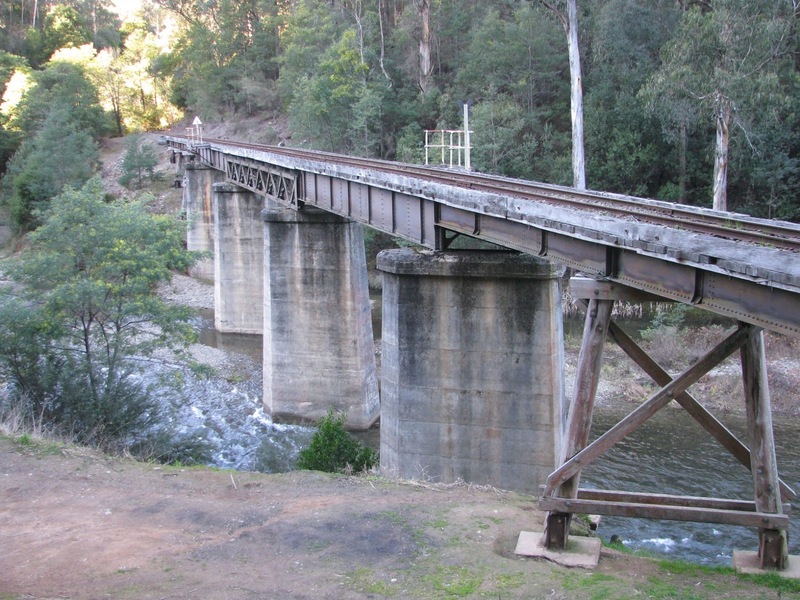 The highlight for me was to go down to the station for a three o'clock ride out to the Thomson River bridge. I can't believe we were there two years ago. My intention is to make a model of this bridge for my On30 and there were a few measurements I needed. I hope this visit is the catalyst to make a start on the bridge construction. Before trying to get my photos and measurements I told the guard my intention and to his credit he called out before we left if the photographer who wanted to get the pictures was on board. I called out I was and away we went. 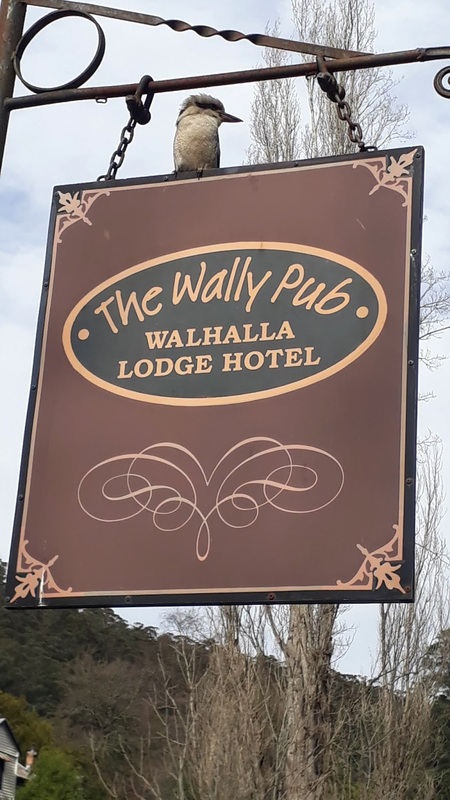 Nice gesture.All the excitement wqas over when we got back to the Walhalla station and we then rejoined the bus for the trip back to Moe. It was fading light by this stage and a few were nodding off due to the early start. Arriving back at the station it was good to see that the Rotary stall was still going and also offering pumpkin soup. They did a roaring trade. It was an uneventful trip back to Melbourne but we were warm in the compartment (with the door closed) As it was dark outside (nothing to see there) we turned to reminiscing back to the good old days, school days and anything else that came along. We arrived at Southern Cross too soon and our eventful day was over. We found a bar at Southern Cross that sold pizzas so we had a quick dinner and back to the hotel again. A nice shower to remove the dirt of the day and as the disco didn't operate on the Sunday night we set the alarm to wake later on the Monday morning.Monday 6th AugustA later sleep in on the Monday was possible and as there was nothing planned we walked down to Flinders Street station and caught a train out to Sandringham and had a late breakfast. Two of us returned early back to North Brighton and spent some time at Trainworld. We met up with the others on the next train and headed again towards Flinders Street. We then needed to walk up to the hotel to pick up our bags and then down to Southern Cross to join the airport bus for Tullamarine. We were due for a 3.0pm flight back to Sydney but our plane was delayed for over an hour.After due process onto and of the plane we arrived back in Sydney after a fantastic four days away with some great mates. It must be good as this is our third trip. Next year Echuca you had better look out as we are coming!